As more of our business activities move online, day-to-day operations have become spread across a number of different applications. Keeping your data up-to-date between all these apps is important, but it can also be time-consuming. So to further eliminate any extra admin-related tasks, we’ve updated our Zapier integration. Zapier is an online platform which acts as a middleman between two different cloud apps and makes sending data between them a breeze. 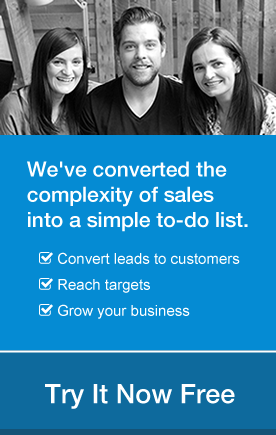 Once you set up the integration, your chosen data moves seamlessly between your accounts. And with a directory of 700+ applications, Zapier offers a quick and secure way of connecting them to your CRM without the need to code. Zapier is a very user-friendly application. A ‘Zap’ is made up of just two elements; Triggers and Actions. A Trigger is an event which occurs in OnePageCRM and causes an Action in another application. An Action is an event triggered by another application and occurs in OnePageCRM. 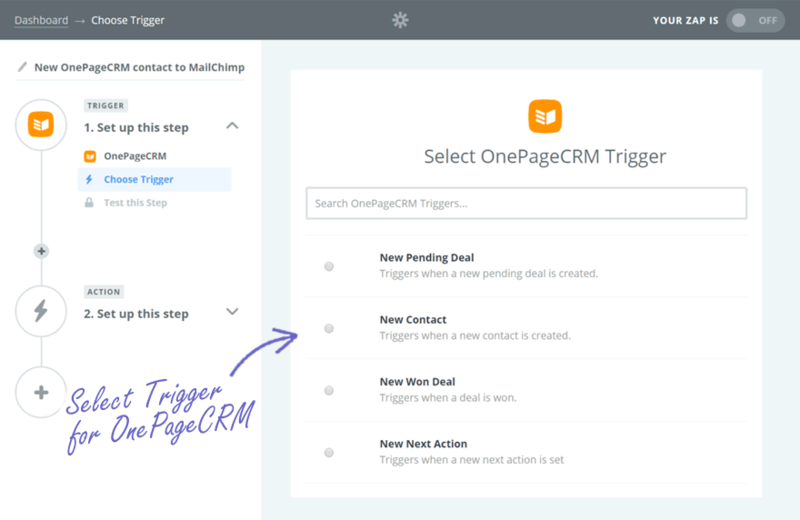 Simply decide which Trigger or Action you want to happen with your CRM, map the fields and you’re ready to go. New Contact: Creating a new contact in your CRM automatically sends the contact’s information straight to any application in Zapier’s directory. For example, creating a subscriber in Campaign Monitor for future email marketing. New Pending Deal: If you add a new Pending Deal in OnePageCRM, you may wish to notify a team member through a direct message in Slack that they have the potential to close a large deal. New Won Deal: If you have a new Won Deal in OnePageCRM, automatically send the deal’s information to an invoicing software such as Quickbooks to create and send out the invoice out to your contact. New Next Action: If you use project management software such as Trello, you can quickly add a task to a board simply by creating a new Next Action in OnePageCRM. 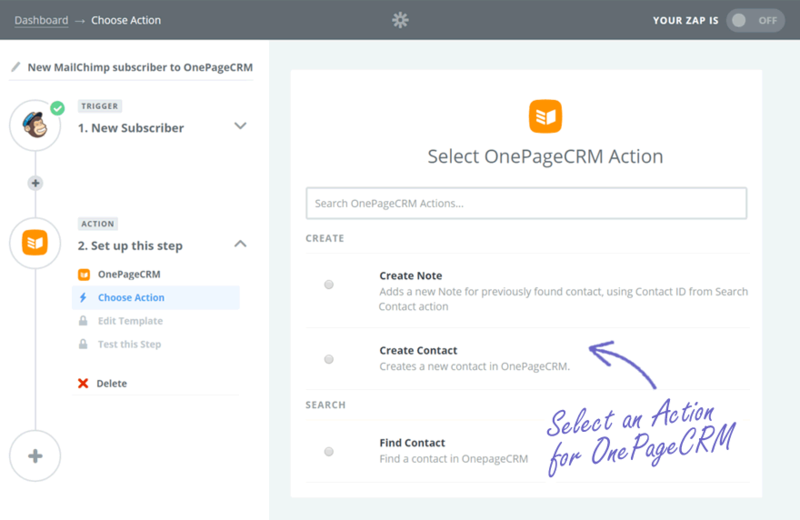 Create Contact: If you add a new contact to your Google Contacts or an email marketing software such as Active Campaign, Zapier automatically creates a new contact in OnePageCRM. Find Contact: If you are generating leads with web forms such as Gravity forms, Zapier can check if your contact already exists in OnePageCRM. If not, a new contact can be created. Create Note: Having found an existing contact (as per Find Contact above), you may wish to automatically add a note to their timeline, to update certain information about the contact. How can Zapier help your business? Create new OnePageCRM contacts automatically when you scan their business card using FullContact Card Reader. Mark a Pending Deal as Won in OnePageCRM and send the contact information to Freshbooks to create an invoice to send to your contact. 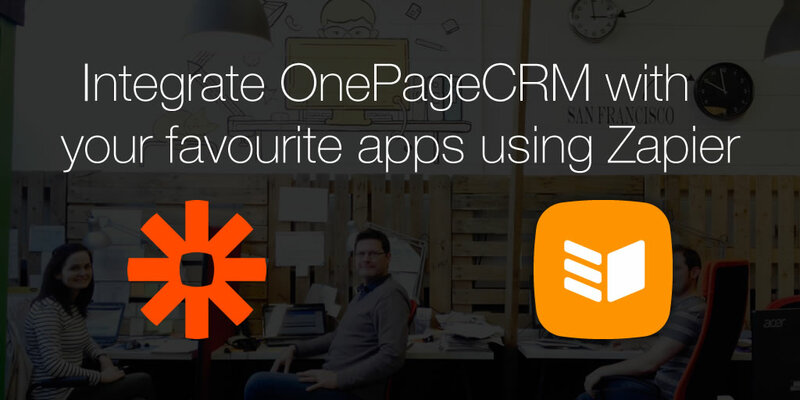 Create a new contact in OnePageCRM for new Twitter followers. Send a text message to a OnePageCRM contact. There are so many possibilities available using our Zapier integration that can help you save time and automate your workflow. For a full list of applications, check out their directory of 700+ applications. Fascinating news, looking forward to hearing what becomes of this integration. Glad you’re a fan :D We’ll hopefully have some more updates soon to help make this integration even more powerful for using with OnePageCRM. Would love to hear any suggestions you have as to how it could be useful for you. Thanks for your feedback, this is an excellent workflow example and I’ve taken a note to include in the next version of this integration.